In factory sites, wireless utilization has been demanded because of its flexibility and convenience. However, risks of instability, i.e., disconnection and difficulty to connect in some cases have been a burden to adopt wireless technology and are bottlenecks of data collection. 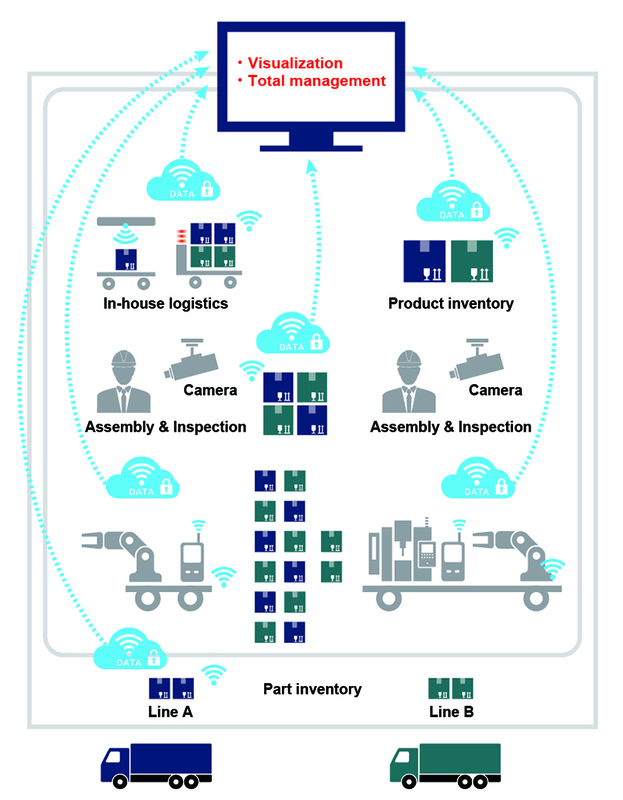 In order to address the issue, Flexible Factory Partner Alliance standardizes SRF Wireless Platform enabling visualization and total management of an overall factory site. It accelerates digitalization of manufacturing by promoting SRF Wireless Platform in the factory sites. There is a variety of factory applications which have different requirements of Quality of Service (QoS) for communications. For example, video inspection, robot controlling, and environmental sensing coexist with communication requirements of wide-band and low-latency, narrow-band and low-latency, and narrow-band and relatively-high-latency, respectively. When these applications operate independently with wireless technology, the requirements of each QoS cannot be satisfied due to interference each other. 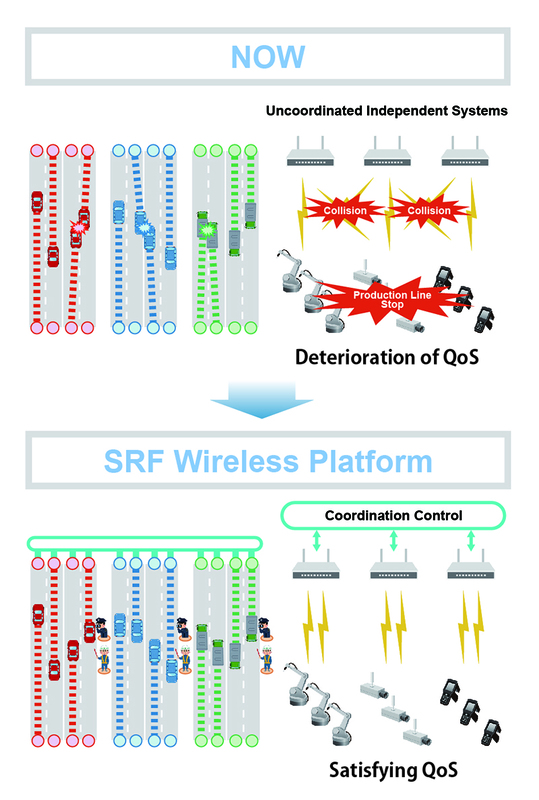 SRF Wireless Platform provides coordination realized by controlling radio resources (frequency, time, and space) to accommodate different systems while satisfying QoS in communication required by factory applications. 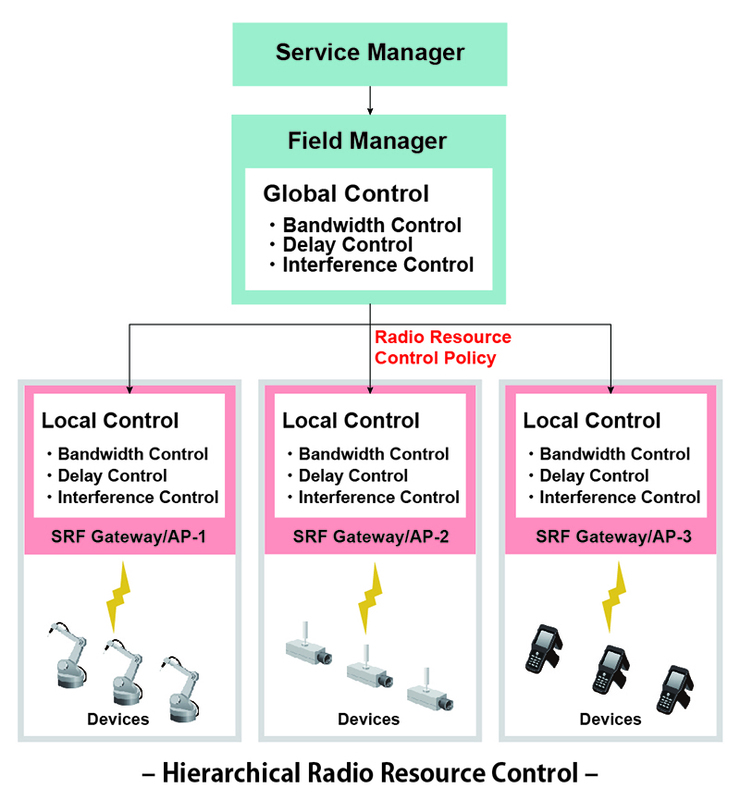 SRF Wireless Platform provides hierarchical radio resource control consisting of (1) global control for coordination of independent systems to satisfy requirements of each factory applications, and (2) local control for each system according to control policy. The hierarchical resource control is conducted dynamically to adapt to change in status of factory applications and wireless environment. It realizes dynamical and optimum radio resource management as well as total management of commutations among factory applications with different requirements of QoS.